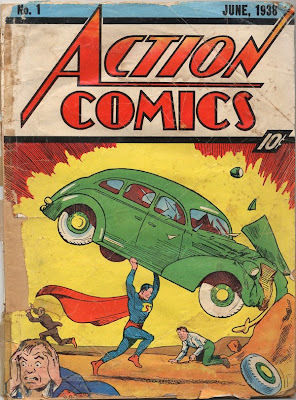 This month marks the 70th anniversary of the publication of Action Comics #1, the first appearance of Jerry Siegel and Joe Shuster's Superman and, as such, the inauguration of the superhero era. Whilst this important anniversary hasn't garnered much attention yet, AFP covers the event here. The blogs have come up trumps, too, and both Mark Engblom's Comic Coverage and Tony Z's Comics N' Things have devoted a month of posts to the anniversary. Even better, you can read Action Comics #1 in its entirety, hosted by the University of Virginia, here. Yes, it really has been a whole year since the School of American Studies at the University of East Anglia inaugurated this blog. In that time, Containing Multitudes has fulfilled (and extended) its brief to serve as an informal record of life in the school, and a guide to issues of interest in our discipline. We've covered a plethora of news stories, and paid particular attention to the ongoing election drama (more of which to come); we've heard from AMS students in far flung fields, made some new international friends, and warranted some interesting mentions; we've profiled research tools, original readings, original writing, and kept a record of a great year of research seminars. Since it's been a while, it's worth reminding everyone that you can keep up to date with Containing Multitudes through a variety of channels. You can receive updates via the Portal, get e-mails (see the sidebar), subscribe to the feed through the reader of your choice, and/or become a fan of AMS on our Facebook page. Whilst the rate of posts may slow over the summer, fear not: Containing Multitudes will be back in full effect at the beginning of the new academic year. In fact, we'll be better than ever. Big new developments are on the way, so stay tuned. Homer Noble Farm. Inset: some of the damage. In other news: this clearly isn't a good time for historic literary houses. Both Edith Wharton's Massachusetts home, The Mount, and Mark Twain's Hartford, Connecticut residence are in dire need of charitable donation. Support The Mount here, and The Mark Twain House & Museum here. "From the moment we walk through the gates of Harvard Yard, they constantly emphasize that we are the leaders of tomorrow. They should have picked a leader to speak at commencement. Not a children's writer. What does that say to the class of 2008? Are we the joke class?" 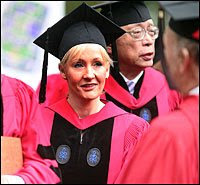 Would you be happy to see J. K. Rowling at a UEA Congregation? Which notable figure would you like to see? If you're after some inspiration, the Washington Post lists some of this year's other celebrity graduation appearances. Election News: "The end of one historic journey..."
The New York Times runs through the historic events that led to this moment; Time examines "How Obama Did It." Both the Washington Post and ABC News explore the ways that Obama's victory has been (jubilantly) received around the world. Meanwhile, Hillary Clinton is still receiving mountains of press. Meghan O'Rourke examines her defeat for Slate, USA Today reports that she may soon return to the Senate, whilst the New York Times and Newsweek explore what's next for her - including exit strategies and the question of whether she will end up as Obama's running mate. The Associated Press reports on John McCain's challenge to Obama to join him in 10 town hall meetings. And Guy Saperstein argues that "The Presidential Election is Not Going to Be Close" for the Huffington Post. ...and the New York Times examines his musical legacy. 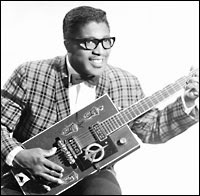 ...and the Guardian assesses Bo Diddley in video. ...whilst Passion of the Weiss provides some MP3s (and rightly asserts: "Diddley’s story doesn’t warrant a blog post, it warrants a biography or a biopic").